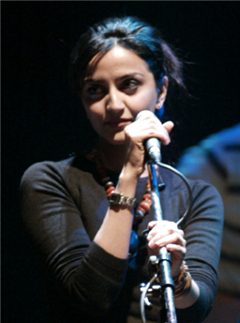 Reena Bhardwaj is a British Indian Singer, songwriter and recording artist best known for her collaboration with AR Rahman and Nitin Sawhney. Versatile to genre and language her repertoire includes a variety of Indian Traditional, Bollywood, World and Popular styles sung in various Indian languages (Hindi, Punjabi, Bengali, Tamil, Telugu) and English. 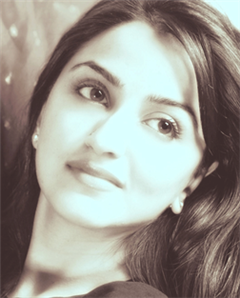 Reena Bhardwaj was born and raised in London. From a very young age she displayed an intrinsic flair for the Indian arts, especially music and dance. She trained in the North Indian Classical Dance form Kathak and started performing on stage from the age of 9. During her teens, focus shifted to singing and she began to impress audiences as she sang complex compositions effortlessly. It was her natural vocal talent that eventually drew the attention of some of the world’s leading pioneers of music, both in India and the UK. An avid academic, Reena Bhardwaj chose to pursue a professional career in Business Management, while continuing to develop her musical interests on the side. She won a sponsorship on the Windsor Fellowship Management program and went on to graduate with Bachelor’s and Master’s degrees from the London School of Economics. She briefly worked in corporate marketing and communications in the City of London. Reena describes her musical career as a “turn of fate” which came about while pursuing her Master's degree at the London School of Economics, when she received an unexpected call from her most favourite Indian Composer, AR Rahman. With Rahman, she recorded her debut song, “Yeh Rishta” for the Bollywood film soundtrack Meenaxi: A Tale of Three Cities directed by MF Hussain, which catapulted her from the world of academics to the top of the Indian Music charts. She became the first British Asian Artist to be nominated for a Zee Cine Award for Best Playback Singer and the MTV Immies Award for Best New Talent of 2004. Next she sang "Baba Kichhu Tha", a Tamil romantic duet with one of South India's most revered playback singers, S. P. Balasubramaniam for the Rajinikanth and Manisha Koirala starrer Baba. She has also lent her voice to Sawhney’s film scores, including Channel 4’s Second Generation, Bharat Bala Production’s Hari Om, and the 1929 Silent Indian Classic, A Throw of Dice by Franz Osten, which premiered with the London Symphony Orchestra and subsequently performed with national orchestras in the Netherlands, Italy, New Zealand, US and Canada. She has collaborated with the UK’s biggest dance duo Basement Jaxx, Basement Jaxx, renowned percussion king Trilok Gurtu, Talvin Singh and award winning British Songwriter Guy Chambers. 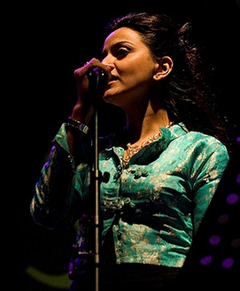 Her songs feature on various compilation CDs (Ministry of Sound’s, Angel Beach; Pathaan’s Indian Sunset) and Sony Legacy’s 2009 Compilation CD The Best of AR Rahman. Why Book Reena Bhardwaj Through ArtiseBooking?